So, time for a January Release post! These will be a bit like Waiting on Wednesday, only published much closer to their release date. I'm not usually one for pure romances, like this one first appeared to be. But on further inspection you can see that it's about more than teenage love; it's about rediscovery, about all sorts of emotions, about the past and about the future, and most of all it's about how life throws things your way that you're never going to be prepared for. 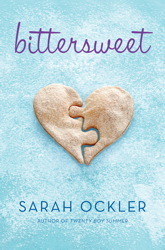 The characters are well-rounded and believable; there's Hudson, who used to be an ice-skater, but after her parents' divorce she gave it up and now only secretly skates on Lake Erie, when she's not making cupcakes or helping her mom and brother at the diner they run. Then there's Josh; a hockey player who could seem stereotypical, but from other reviews I've read he seems to be a very likeable character who doesn't have it all, but has a lot to gain. Their story isn't just cute, it's believable, and I'm sure this will be a good read for anyone looking for a fun, but not overly simple or boring story. The summary makes it seem like a less remarkable story than I hope it will be, but we'll just have to wait and see. Perhaps it will be a good first venture into this very romantic setting - being so used to dystopian and adventure, I know I might take a while to adjust to this kind of plot, but I'm willing to give it a try!